In the spirit of full disclosure, I want you to know that I did not see the entire half-time show at the Superbowl game last night. I saw about the first five minutes and the last five seconds. It’s not that I’m not a fan of Beyonce (I’m not) nor that I’m a football purist and watch the Superbowl to watch a football game (I do). It’s just that I had to walk our dog so that she could do what dogs do. Do I really need to explain? We are living in a 23 foot RV, so one of my jobs is to walk the dog. Half-time was a good time for doing my chores. 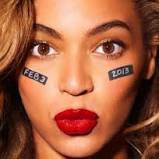 So, my remarks on Beyonce and the Second Commandment must be taken with this circumstance in mind. Now, rewind to about three Sundays ago. My wife and I were sitting in a Sunday School class studying the book of Deuteronomy. This particular day the teacher, Josh (an elder and an excellent teacher), was taking the class slowly through the first four commandments. He began the class by talking about the second commandment which reads, “You shall not take the name of the Lord your God in vain, for the LORD will not hold him guiltless who takes his name in vain” (Deut 5:11). Josh told us that this particular commandment was drilled into his head by him mother. She absolutely would not allow anyone in the house to swear using God’s name. “Gosh darn its” might have been just barely allowable because we all know what that phrase replaces. If we want the blessing of God — and I do — then receive his blessing according to his holy character. Knowing God in his holiness will put us in the right heart condition for receiving it. I was not or am not able to articulate this as well as you have, however, I too was really upset at the performance and her “God Bless comment”!! Of course the other people in the room think I’m from Mars most of the time, but I am really Glad there is at least one other man out there who has the same passion and desire for God’s Holy blessings and wants to live his life in a Godly way!!! Bob, I’m glad I found you Blog!! !